The Boom Hand Replayer is a fully animated hand history replayer for use by players on PokerStars. Share your hand histories in real-time with friends via Twitter and Orkut while enjoying a full range of options such as comment, like, and rate. There have been many hand history replayers released for online poker players and the PokerStars Boom Player ranks among the best. To get started, you will need to register using your PokerStars screen name and password. Once the registration process is complete (approximately one minute from start to finish), players can upload any hand of their choice by clicking the "Boom" button located at the bottom of a table's display. Besides the obvious use of being able to replay and share your personal hand histories with friends and followers immediately, the Boom Hand Replayer is also a great tool for being able to keep up with the action of high-stakes players and popular PokerStars pros like Bertrand "ElkY" Grospellier and Daniel Negreanu. The controls for the hand replayer are very straightforward and there is virtually no learning curve. All you have to do is upload your hand history (hands played from the PokerStars client will automatically upload into the Boom Replayer when prompted) and then control the speed of the action via the slider at the bottom right. From the control panel, you can rewind, play, pause, stop, replay, and fast-forward. Below there are options to perma-link, embed video, send e-mail, share via Twitter, and share via Google's Orkut. 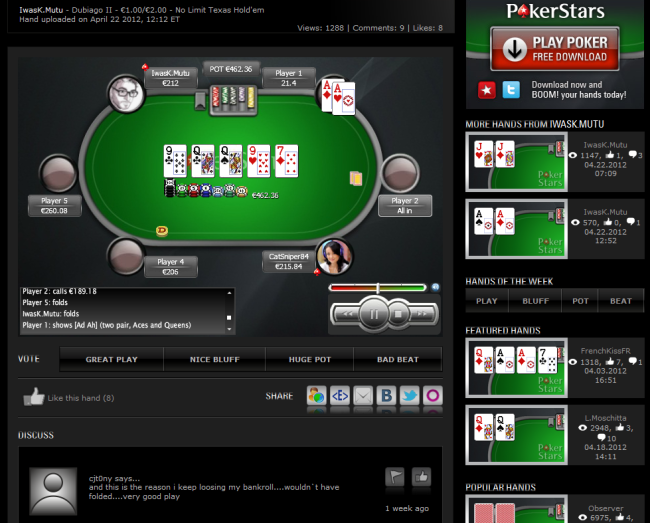 The right widgetized area of the Boom Hand Replayer features hands from the current player being viewed along with "Hands of the Week," "Featured Hands," "Team PokerStars," and "Popular Hands." For example, the Hands of the Week section is divided into four sub-categories: "Play," "Bluff," "Pot," and "Beat." There is a full comments section below each hand history for any registered PokerStars player to chime in with his opinion, plus the option to "Like" a hand and comment or report any player's critique. Boom is not meant for uploading text hand histories, but rather interfaces with the PokerStars client to give users a much higher-quality, real-time feel. The Boom Hand Replayer from PokerStars is 100% free and will work with any PokerStars hand history. To find out more about this free software, visit BoomPlayer.com.